My new romantic suspense series - about finding love, and saving the future. An exciting time travel series - follow Kane and Elizabeth as they find their way home. And she does - right into Jackson Kane's path. He is a time traveler, from the future, and on the hunt for a rogue agent. 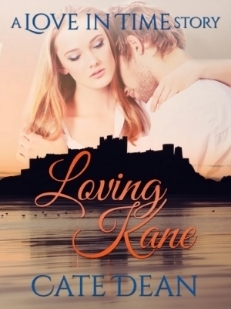 Their attraction is immediate, unexpected - and for Kane, an unwanted distraction. When he is injured protecting Elizabeth, she makes a decision that will change both of their lives. She takes him home. Once Kane is healed, he goes after the agent. But his journey back to war-torn London takes a sideways turn, forcing Elizabeth to make another choice. She follows him into the past, to help him stop one man from changing their future. Trapped in the ancient past, Kane and Elizabeth must find a killer - before one of them becomes a victim. Jackson Kane and Elizabeth Barrritt head for home - and land at the edge of Roman Britain, on Hadrian's Wall. The wrong side of Hadrian's Wall. After Kane is accused of murder just minutes into their painful arrival, Elizabeth does everything she can to free him. When the body count rises, the investigation takes a dark turn, and she becomes desperate to prove him innocent. She has to find the real killer - or risk losing Kane forever. *Includes a preview of Second Chances, Book Three of the Love in Time series. This is a short story that takes place after the end of First Breath, Book Two of the Love in Time series. Can the pain of rejection ever be forgotten? Kane and Elizabeth fall out of the portal, and into the England of Elizabeth's time. She is ready to stay put, if only for a few days. Ready keep what happened between them firmly in the past. But when the transport goes missing, Kane's temper, and a few careless words, throws it all in Elizabeth's face. Can she put his rejection behind her, or will it tear them apart? The final journey in the exciting time travel romance series. Kane and Elizabeth tumble out of the portal, hoping they landed in Kane's time. Instead, the faulty transport drops them in Victorian London, where Elizabeth meets an ugly bit of Kane's past - the artist they destroyed in the name of science. Determined to reverse the damage to his career, Elizabeth befriends him. Her desire to help him puts her in the path of a new enemy, and a young thief who steals her heart. As Kane struggles to repair their only way home, they have no idea a deadly plot is closing around them. A plot meant to end with Kane's death. *Includes a sneak preview of Three for Christmas, the the final chapter of Love in Time. The final chapter in the Love in Time series. Kane and Elizabeth are finally home, and settling into a life with their newly adopted son. But the London of Kane's time has been stripped of the passion that sustains Elizabeth. She wants to stay, but is afraid that life without art is a life she can't endure. Kane has an idea, but it means stepping over boundaries she set long ago. Will Kane's daring plan keep her with him, or will they lose each other, after all they endured to stay together? *Includes a preview of No Greater Love, book one of Redemption of the Seven. The complete collection of the Love in Time series, in one box set.